Nestlé is an iconic international brand producing and supplying a vast array of food and beverage products throughout the world. Nestlé Quality Assurance Centre (NQAC) services 18 manufacturing sites across Australia and the Pacific region. 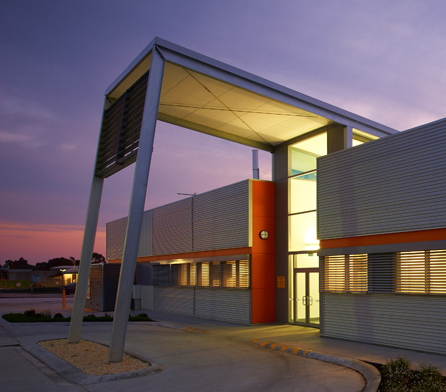 Initially, Nestlé engaged Wiley to prepare a feasibility report for the relocation of their NQAC facility from the recently sold (to Simplot) Pakenham site, to a site at Mulgrave which houses their existing Peter’s operation. The new design would provide logical flow for sample testing procedures to eliminate existing operational inefficiencies, cross-contamination and OH&S issues. This building had to meet strict Therapeutic Goods Administration (TGA), AQIS, NESTEC, AS & NATA standards and accreditations. It was also to meet local and global Nestlé requirements for pathogen containment, hygiene, building services installation, energy efficiency and general building aesthetics. Nestlé international communication and approval network, for critical aspects of the project, created intense time and budget constraints. Given the NQAC role was independent to Peter’s Mulgrave operations; vehicle and pedestrian access issues, along with site security and general toilet/amenities requirements, had to be addressed. The proposed building area contained a demolished building slab on a filled platform that included the main underground HV electrical supply for the entire site. Nestlé operational reporting restructure during building stage led to change from NOSQAL to NQAC (Nestlé Quality Assurance Centre) with associated branding logo and colour scheme changes. Scheduled commissioning of existing equipment whilst maintaining operations at the Pakenham site. Scheduled services and infrastructure tie-ins with other Nestlé ongoing/planned upgrades, primarily chilled water for air conditioning, fire hydrant ring main works and electrical upgrades and include ability to monitor/meter all shared services with the Nestlé Peter’s facility at Mulgrave. The site had roadways on both sides. The back of the building needed special attention to satisfy aesthetic considerations. The filled platform meant the rear roadway was approximately 3 meters below the front roadway. Following an options analysis and further discovery meetings with the Client, Nestlé chose to build the new facility on a disused site next to the Peter’s Factory. Wiley worked closely with the Nestlé Lab Manager to formulate the design brief and produce a concept layout for the new facility, taking into account new/relocated equipment and the opportunity to upgrade the entire operation. Individual areas were planned with lab staff (down to drawer size and door swing) to optimise efficiency and flexibility. A modern, high-tech exterior was designed for the laboratory to convey the precise and highly specialised work being carried out within. It also delivered four aesthetic building facades to camouflage unsightly building services. Impressive statement entry and shared administration space, with a raised roof atrium area to convey the values of the Nestlé brand. All roof mounted exhaust stacks from fume cupboards were arranged in pairs to minimise visual distraction. The remaining roof plant was concealed behind roof parapet. 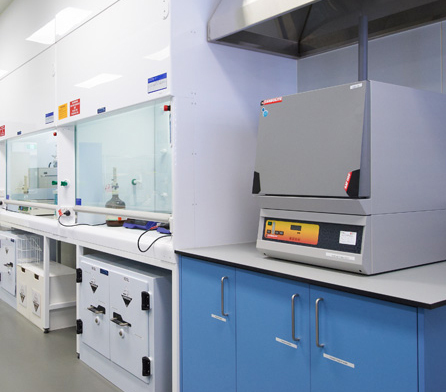 The operational layout was arranged so the Microbiology and Chemistry labs could share admin and amenity areas, yet remain independent for security and contamination purposes. Services coordination—both lab areas were designed with a trafficable insulated panel ceiling space. This innovative ceiling space design provided access to all piped and electrical services, light fittings and numerous air conditioning systems; so that maintenance could be conducted with minimal or no impact/access into lab areas. 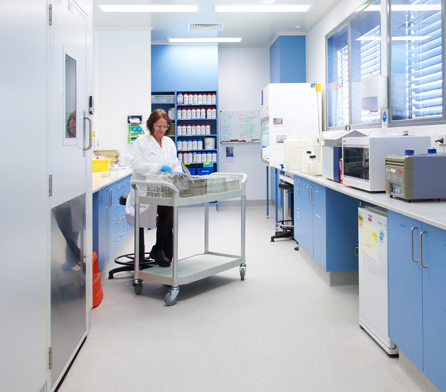 The PC2 Salmonella lab was constructed of insulated panel walls for both cleanroom requirements and ability to better seal the room for pathogen containment. All waste passed out through a sterilizer and staff entry access was through a series of interlocked doors. Design had to provide good natural lighting opportunities into the labs, without allowing direct sunlight or heat to interfere with testing. 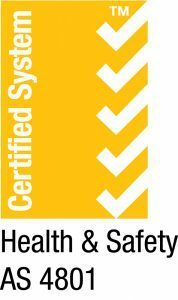 The facility was system engineered to manage and deliver positive/negative air flows across multiple work zones. 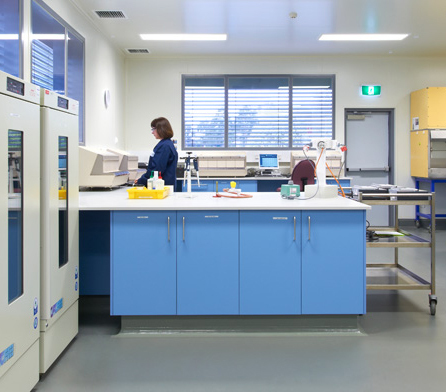 Pathogen containment and cross-contamination prevention were addressed by installing independent air-conditioning systems for individual lab areas—allowing for variable exhaust conditions from 6 new fume cupboards and single pass through hepa filter air to PC2 lab. UV stabilised air locks for pathogen/bacteria removal, designed with fail-safes for safe human access. Gas monitoring systems for Nitrogen, Helium, Argon, Natural Gas, Instrument air and Hydrogen. Communications, data and emergency alarms connection to existing site network. Air conditioning via chilled water recirculation, coming from an extension of the existing ammonia plant. Reverse Osmosis Systems including a reverse osmosis water reticulation system to reduce staff trolley movements from main RO unit. Complete coordination of all portable and fixed lab equipment services. All Chemical waste streams were directed through a dosing and neutralisation system. 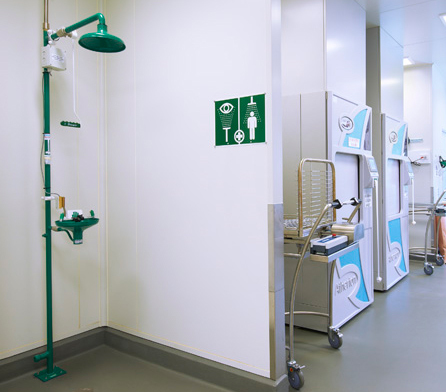 All electrical supplies were organised through sub-boards ensuring individual lab area emergency stops could isolate local electrical supply, as required. All electrical wiring was mounted in wall ducts 300mm above bench tops out of gas explosion zone. All building columns were fitted into the wall frame, removing them from the lab areas and erasing any interruption of the horizontal lines established in the modern building façade. A drop-off zone for samples required modification to the existing roadway, without interrupting general site access. PC2 rooms and wet areas fitted with insulated panel ceilings and walls. Concrete floors with slip resistance vinyl coverings and epoxy in wet areas. 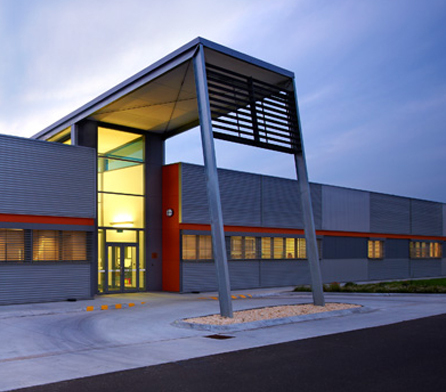 External cladding was mix of Exotec FC expressed joint sheeting with horizontal and vertical Spandek fascia sheeting and expressed steel channels painted orange to match the new NQAC logo branding. Wiley delivered Nestlé a building to be proud of; a fresh, modern QA facility whose future-focussed, specialised design provides the client with greater control of their current operations and significant flexibility as they expand into potential new food products and processes.